A few months ago when I did a "My Favorite Things" week here on the blog, I featured my favorite rotary cutter. My favorite is the 45-mm Quick Change Cutter. 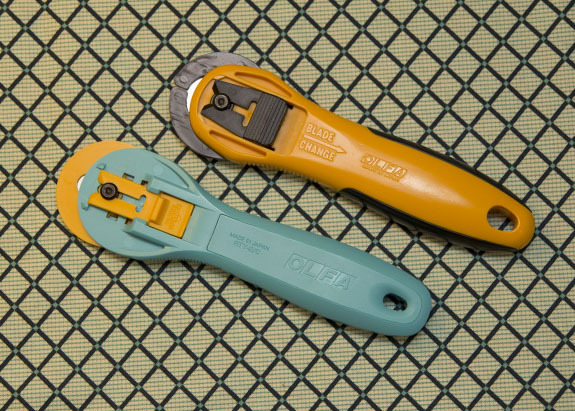 When I contacted Olfa about donating a rotary cutter for the giveaway during that week, they asked if I was interested in trying out a new cutter coming out soon. Of course I said yes, and a few months later the Splash cutter showed up on my doorstep. I immediately started trying this guy. I love the fun bright color. There were a couple things I noticed. It felt different in my hand as was definitely lighter. It took some getting used to. Also, it's pretty slick to hold. I missed the black rubber that wraps around the handle to provide a better grip on my other cutter. Other than that it's a great Olfa cutter. I've said before, but Olfa is my favorite brand for rotary cutters. I also love the quick change feature of both of these cutters. With the blade open, you notice it's fully exposed on the Splash. The other cutter has a split guard that provides protection from the top of the blade while cutting. I do prefer having the extra protection from the blade. They both have the quick-change blade feature which is fantastic to use. 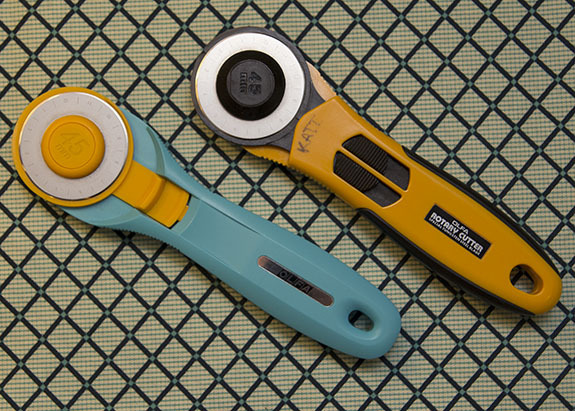 The 45-mm Quick Change Cutter retails for $31.49 vs. the Splash that retails for $17.99. After using the Splash for several months, I'm equally comfortable using either one. They both sit on my cutting mat, and I simply grab whichever one is closer. I still have a slight preference for my old cutter over the Splash, but both are great options. Thanks to Olfa for letting my try out the new Splash! Thanks for the review I am looking for a new rotary cutter. this was very honest and I appreciate that.... for the price it definitely offers a nice cutter but I can see why your original one is nicer in many ways too....I'm a sucker for the fun colours though! I love your original. I have 4 of them, 2 in the 45 size and 2 in the 60 size and I recommend them to anyone new to quilting. I've had a few too many run ins with the exposed blade on the older style cutters. Thanks for your review. I've been eyeing the new Splash cutter but I think I really love my old Olfa best and don't need to replace it now. I love Olfa. It's the cutter that I used when I started quilting and have been totally satisfied with their product. I tried a different brand at a friends house and really noticed how much harder it was to use. I also use an Olfa mat, as I feel that it allows your blade to last longer. Thanks for the review. I have them both and I agree about your assessment - I am nervous about my finger slipping on that exposed blade on the splash. Love Olfa cutters but I think they need to guard the blade top. I really like my Olfas. 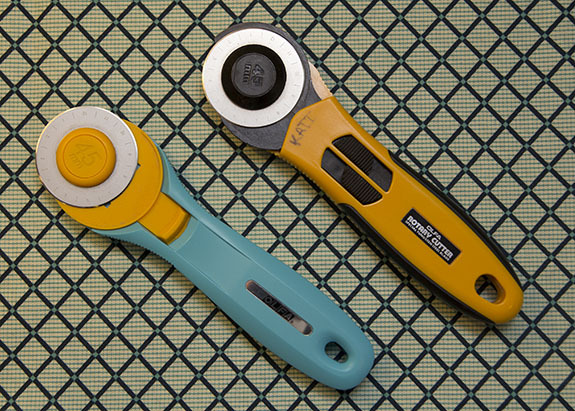 I have several sizes and they are my must have tool. I think your old cutter is such a snazzy version - the Splash looks like the trendier brother to my bog-standard one.